Magna Chiropractic Blog: How's Your Posture? This is the question that was asked in our last newsletter we sent to our patients. If you’ve read that newsletter, you now know some basic information about posture. If you haven’t, please see it linked on our website. As promised, here are some proper positions for your posture, with help from the American Chiropractic Association. 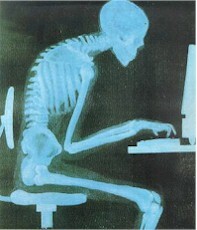 Affecting your posture on a daily basis is also your computer workstation. It is hard to pinpoint the countless positions your computer, keyboard, chair, mouse, etc. should be in. We have decided to link you to OSHA’s website on computer workstation checklist to ensure that your posture isn’t hindered by your work station placement. Go ahead and compare your workstation and the workstation of those around you for proper placement. If you notice your posture has changed or is changing, if you are starting to have pain, please contact us at Magna Chiropractic today at 746-9400.